While rides based on movies can be found in every Disney park, Hollywood Studios is the theme park dedicated to cinema in all its forms. Attractions themed to classic films and television shows, and in the case of the American Idol Experience, not so classic tv shows, form many of the key experiences. While Disney only recently purchased George Lucas's legacy of films, Hollywood Studios has long hosted one of the original Star Wars rides. Star Tours was a state of the art simulator ride when it opened in the 80s, featuring technology previously used to train fighter pilots. It remained a popular thrill ride for years, but the experience felt increasingly dated. Promised film updates never materialized, and simulators became so common that they could be found in shopping malls. Even the release of the Star Wars prequels did not inspire an attraction update, though that may have saved the world from Jar Jar Binks appearing alongside Mickey Mouse. In 2011, Star Tours finally received it's long rumored upgrade, with a new film that fills the gap between the prequels and the classic Star Wars films. This allows the attraction to pull locations and sequences from the entire canon, while avoiding most of the less popular additions. Certain annoying characters may make a short cameo appearance, but they're nearly the victim of a hit and run. Like the original ride, Star Tours: The Adventure Continues places guests on a commercial "StarSpeeder" space flight that quickly deteriorates into chaos. The updated version features an animatronic C-3P0 as your accidental pilot, with the rest of the effects presented through surprisingly effective 3D screens. Instead of using 3D for cheap gimmicks, the technology is used to create a feeling of depth and realism that improves the overall experience, rather than distracting from it. The new additions also include a randomization system, which changes out several major and minor parts of the ride, creating many possible combinations that keep the attraction fresh. Overall, it's one of the best attraction updates that Disney has completed, changing many of the details but retaining the fundamental spirit of the ride. Star Tours begins it's queue in an unspectacular fashion, winding underneath unimpressive Ewok huts, past a stationary AT-AT, and by the stage for the Jedi Training Academy show. Entering inside, the experience quickly shifts from dull, faux movie sets to immersing visitors inside the world of Star Wars. Everything within evokes a comical vision of a futuristic spaceport, which just happens to echo modern problems with air travel. The first room features C-3P0 and R2-D2 preparing a full size StarSpeeder for its next voyage, as a giant screen displays ads for many different intergalactic destinations. The next room includes a baggage handling droid who seems to be absolutely clueless at identifying legitimate contraband in luggage. There's also a security checkpoint manned by a rather rude robotic attendant, voiced by Patrick Warburton. After making it through the queue, visitors are given 3D glasses and shuffled to one of the currently occupied vehicles. Since photos are forbidden during the ride, this promotional photo is an example of how much promotional photos exaggerate what a ride is really like. After several safety messages and buckling in to the seats, the front panel of the simulator opens to reveal your animatronic pilot and the view outside, otherwise known as the screen. The contents of each journey vary, but include daring escapes from evil Imperial forces, encounters with bizarre and dangerous alien worlds, and constant bickering between C-3P0 and R2-D2. The simulator matches the action well and provides a convincing experience, but is mild enough for all but the most thrill adverse riders. In the end, you safely smuggle a rebel spy to the good guys, and are congratulated for a job well done. Star Tours has a unique problem for a ride, in that the queue is almost as entertaining as the attraction itself. This is a wonderful achievement that should be duplicated at all popular rides. Unfortunately, Star Tours is also an efficient attraction that usually has low to moderate waits and moves its line rather consistently. Many people decide that they want to continue watching what's going on in the line or take more pictures, and will actively block other guests from making their way to the ride itself. Cast Members carefully count out the available seats for each Star Tours simulator, but there are times where people refuse to sit at the end of a row or switch rows to sit with family. Since rapid loading of the ride is the first priority, Cast Members may miss this game of musical chairs, causing some guests to wait for another ride when their row mysteriously fills too fast. The pre-ride video may be mildly amusing, but not enough to be worth watching a second time. Star Tours, like all major attractions, has a gift shop as its exit. This particular gift shop is the main location for Star Wars memorabilia at Hollywood Studios and is packed wall to wall with goods. It's also a surprisingly small store, with barely any floor space for either browsing shoppers or riders trying to exit. Shoving, smashing, trampling chaos is the result, though it's also a decent indication that Disney will make another obscene load of money when they finally build more Star Wars attractions. 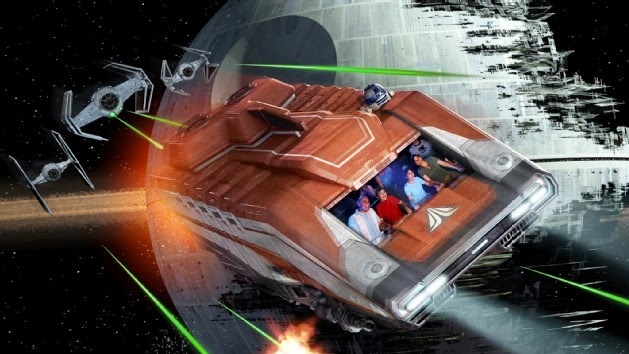 Star Tours: The Adventure Continues is a spectacular update to a classic attraction. It manages to embrace a wider vision of the Star Wars universe while avoiding the prequel movies' infamous flaws. Featuring a spectacularly detailed queue, mild thrills, and high re-rideability, it's a great ride that entertains guests of most ages, even those who don't like Star Wars. Definitely worth experiencing multiple times, though it's probably best to save Star Wars souvenir shopping for Downtown Disney.